Gold is regarded as one of the most prestigious metal. 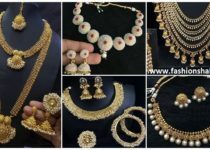 Especially In India, women love gold jewelry as they enhance the overall look and goes really well with the Indian Outfits like saree, lehenga choli, and even Indo western dresses. Be it as little as a ring, chain, pendant, and gold ear studs or be it big necklaces and jumkhas, anything with a touch of gold will increase the status of the wearer. Not only women but in India, even men wear a gold ring, bracelets and chains on regular basis. 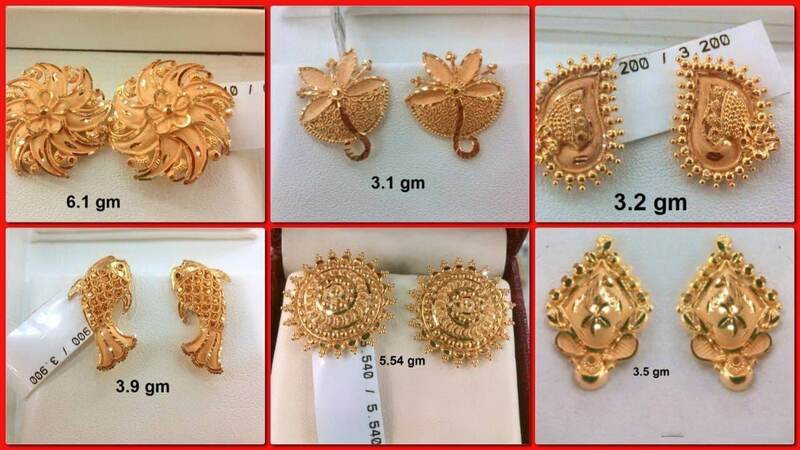 Gold is known for wealth and has an important place in Indian culture. 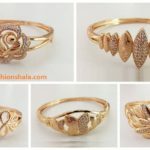 Often gold jewelry is given as a gift to the newly wedded couple, newborn baby, at baby showers and many more functions. Out of all the gold jewelry, Stud earrings has my heart! The details on the piece of gold make it so so rich. Different patterns of different sizes are available now. The carvings and designs are so beautiful that one cannot want to buy them! Below are some of such amazing designs. I m very sure that few of them will definitely catch your attention. 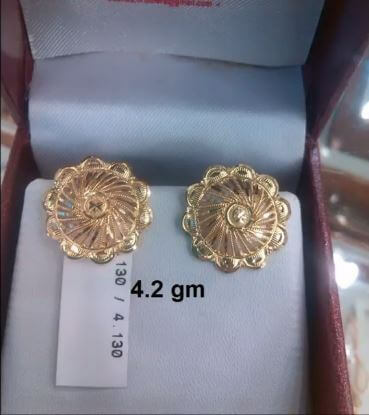 The earring shown in the picture above is an excellent design and the earrings are made up of just 4 grams. 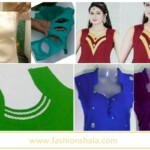 This is a kind of universal designs that you can pair with any outfit. 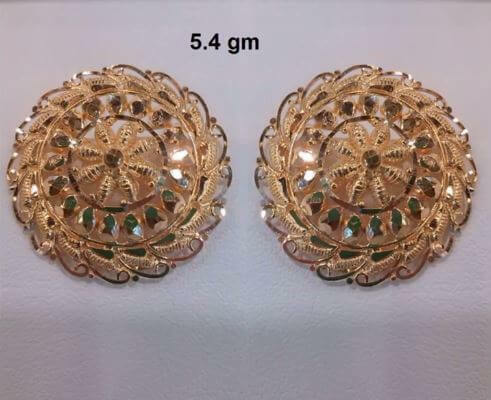 The details in the earrings are outstanding and they will be so in your budget. Other than that, this circle shaped earrings represent the traditional Indian Culture. When you look back to the various carvings on the caves or temples you will find these kind of designs are very common there. They say Flowers are a way to women’s Heart! To an extent, this statement does feel right! Flowers represent feminity. In Indian culture, Flowers are known for its divinity. 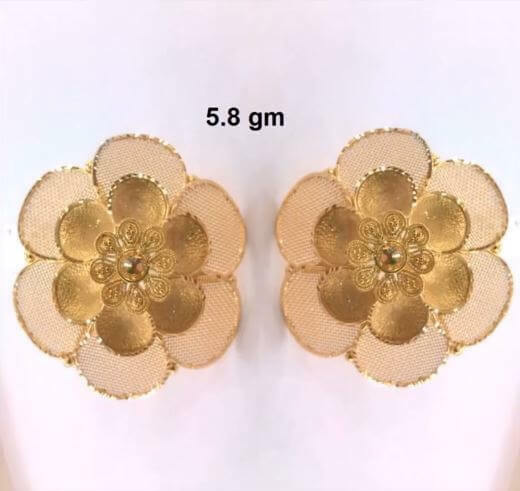 This beautiful flower gold stud earrings will look good on traditional south Indian saree or silk dress. This earring will enhance the face of any women. 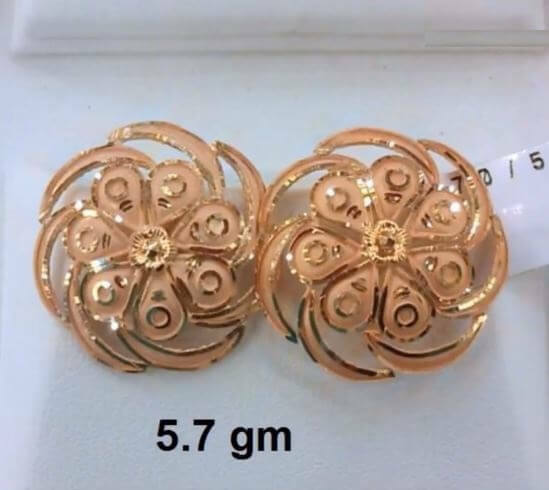 These earrings weigh 6.1 grams which are light and quiet under budget. The beauty lies in the eyes of the beholder. This is such a strong statement. This earring are all about our perspective, Some will see the butterfly design while some will feel that it is a Diwali diya (Lamp). Due to the stem-like design, it even looks like a lotus. All these three things have great importance in Indian culture and represent the peace, love, and divinity. 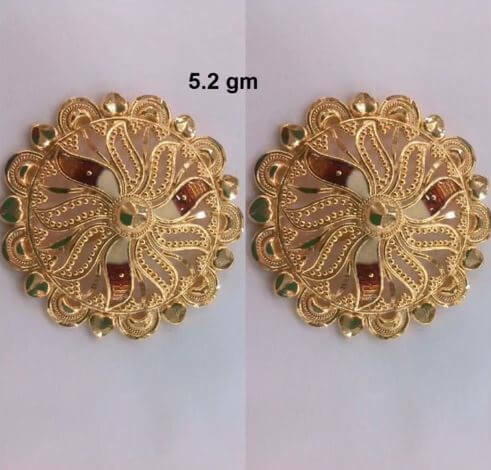 This is the small beautiful stud that will look great on any women and will instantly increase the beauty of any face. Be it your little angle or your beautiful wife, mother or friend. 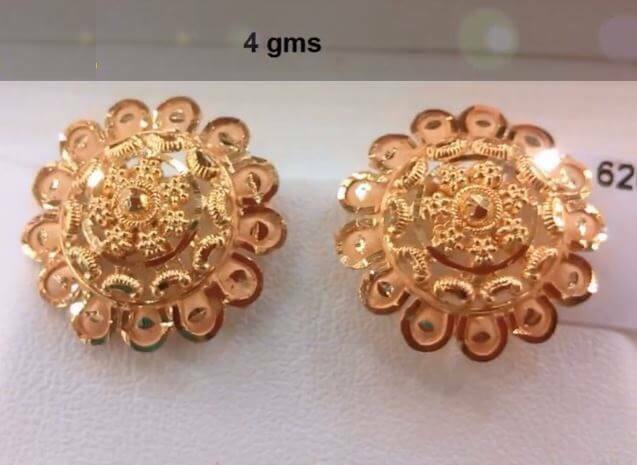 These Gold studs are excellent for regular wear. It will look good on any outfit. They are not too large and not too small just the right size for your beautiful face. It is a beautiful earring and can be a perfect gift for your daughter or any girl you love. This design is similar in shape to the 1st design that we saw. It is in a flower shape which represents divinity and feminity. When you wear such earrings you feel empowered. The message that these type of earrings deliver is so strong. 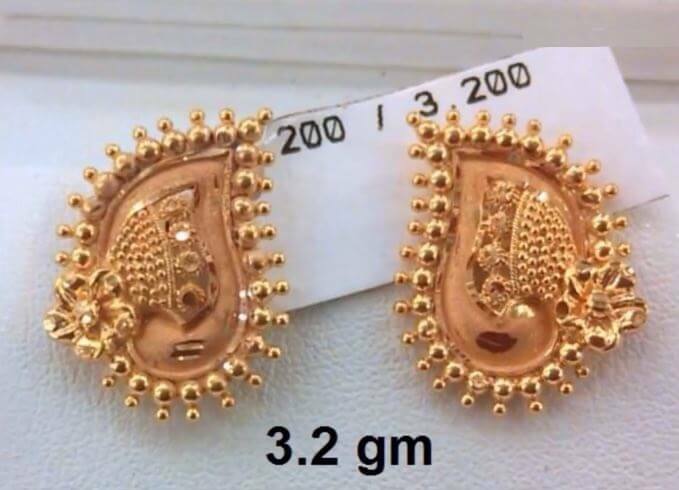 This earring will look good on traditional Indian Outfits. It will quickly increase the beauty of your face and will enhance your facial features. 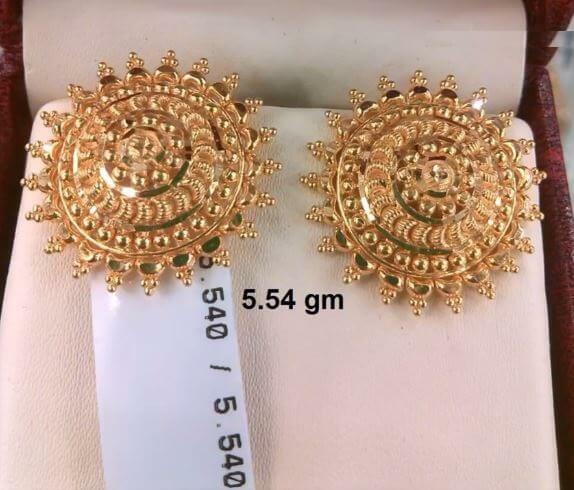 The weight of this traditional earrings is 5.7 grams which is under budget and can be worn on regular occasions. Are you a fish love? Haha! then this earring is specially designed for you! The carvings are so beautiful and the detailing is excellent. This will be a great gift for your Bengali friend. 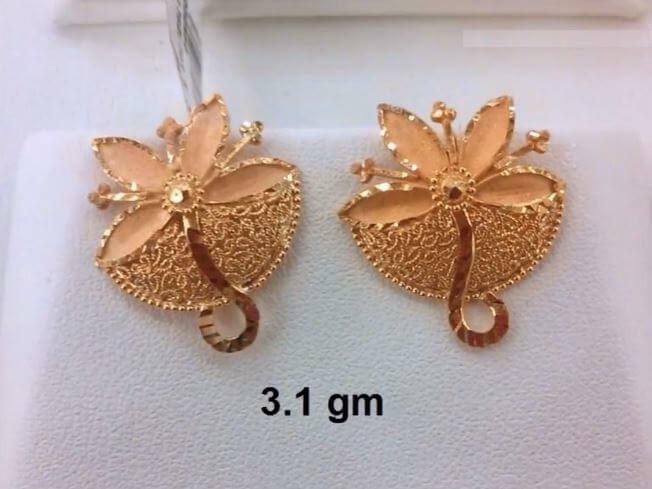 This earring weighs 3.9 grams and is lightweight which makes it ideal for regular wear. The eyes of the fish have red studs which makes it even more beautiful. 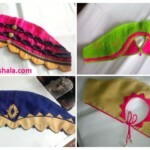 Are you looking for something very traditional and attractive as well? This might just be the earrings you are looking for. the design is so simple and elegant. It will represent the simplicity of the wearer. It is good for daily wear as it weighs just 3.5 grams. The details are outstanding and represent the Indian culture. 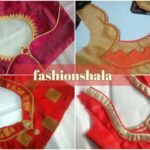 You can wear it with Gujurati bandhani, south Indian silk saree or patola and will definetly enhance the beauty of your outfit and face. This is an amazing design that shows the beautiful peacock. Everyone is awed by the beauty of peacocks. Peacock represents happiness, peacefulness. In this design the details are excellent. The flower crown on the peacock head represents the strength of the peacock as well the strength of women. This will be an excellent gift for your strong mother or wife. 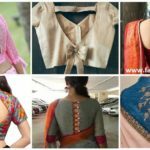 It suits well with the traditional saree and dress. If you looking for something fresh and wild at the same time. This is a good option for you. The earrings here represents a wildflower. 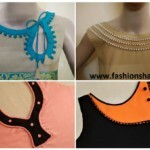 it will go with any traditional designer outfit. 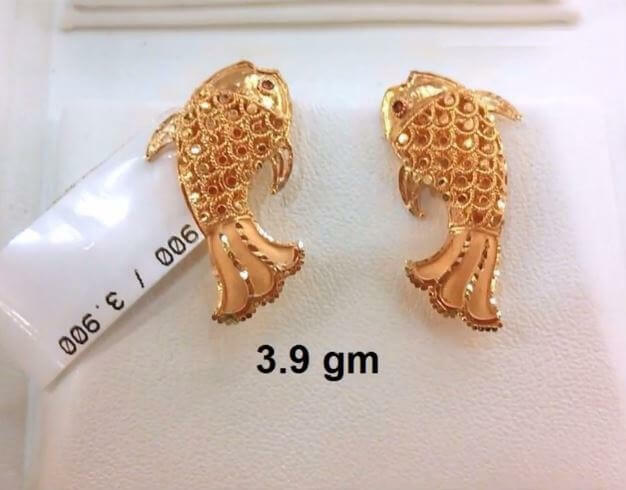 the weight of these earrings is just 2.8 grams. 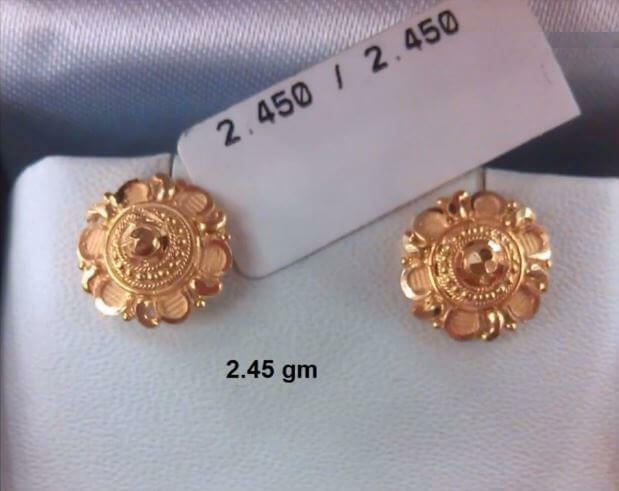 This earrings weigh 4.2 grams and can be a perfect gift for your mother or grandmother. The circle represents the life which proofs what comes around goes around. 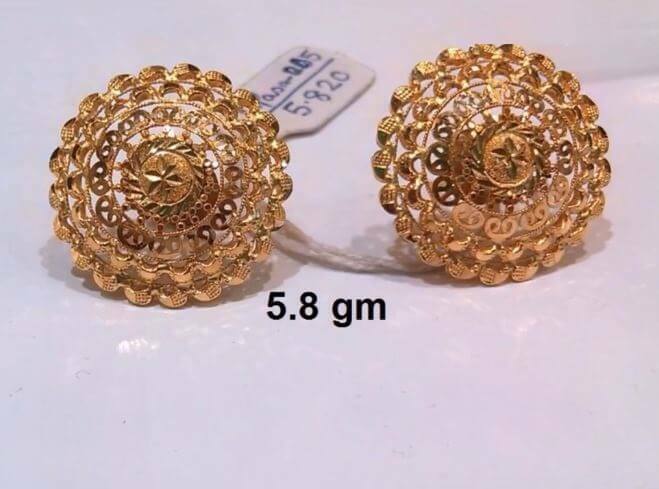 This Earring ware suitable for traditional sarees like patola or silk saree. It will enhance your look! This is the earring most suitable for bride or bride’s mother. They weight 5.8 grams and a big enough to be seen. 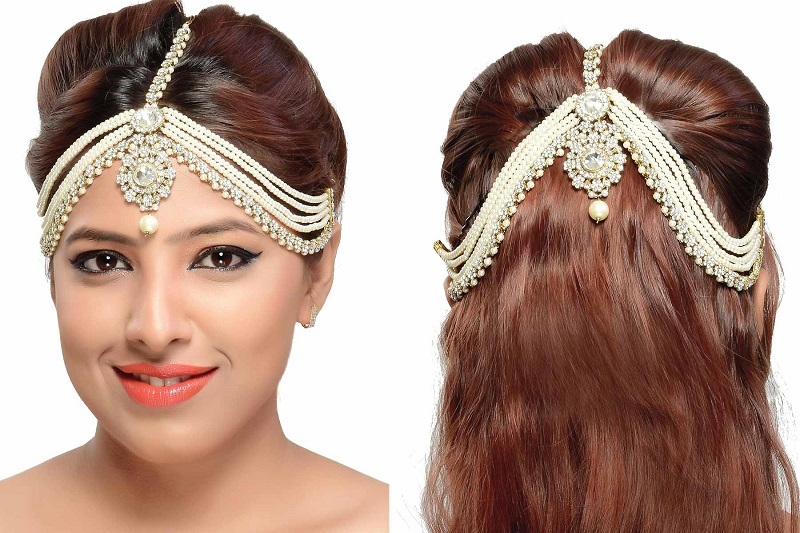 Take a bun hairstyle and wear this earring with your beautiful saree and people will surely turn head around! The carvings are beautiful and give are very vintage look. Again, these earrings will let you have a perfect traditional look. 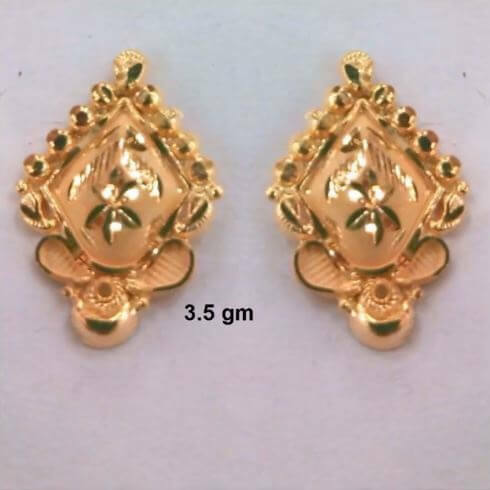 Wear this earring during the Indian wedding. The earring represents the peaceful nature of women. The delicate work on the earring is outstanding and amazing. People will ask about this earring for ages! This is astonishing gold earrings with red and green meenakari like work on it. The circular shape with flower petals makes a great combination. It is a perfect gift for your grandmother or mother. It weighs 5.2 grams and will go with all the traditional outfits. The finishing of these earrings is out of the world. It looks sharp due to the shine on the earrings, The curved shape border on the earring is improving its beauty. The diamond stones in the middle are changing the whole look of the earring and is adding charm in it. The weight is 5.4 grams. The design of these earrings is awesome. The combination of gold and rose gold is very unexpected and is amazing. 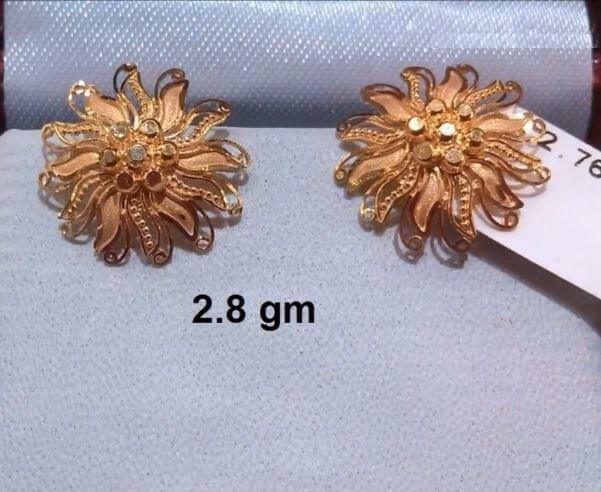 You can wear this earring with any designer outfit. 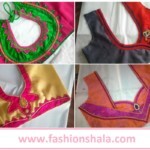 Be it Traditional outfit or western outfit, it will look beautiful on any outfit. 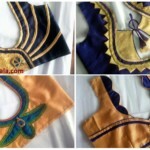 The design is very elegant and will give you that royal feel. 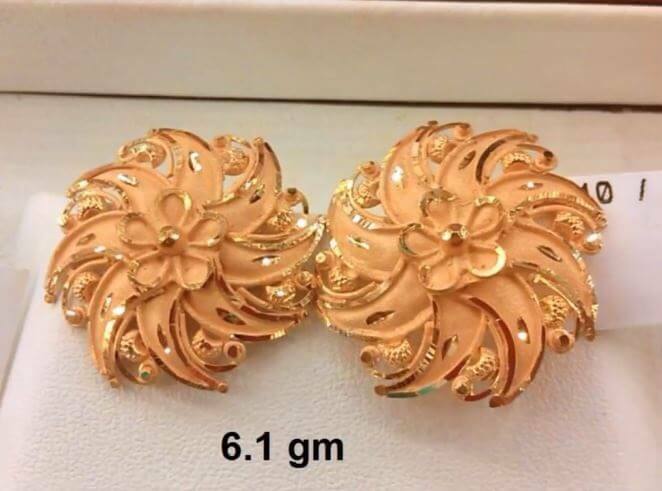 The weight of this earring is 5.8 grams. This can be gifted to your lover to show our deep love. 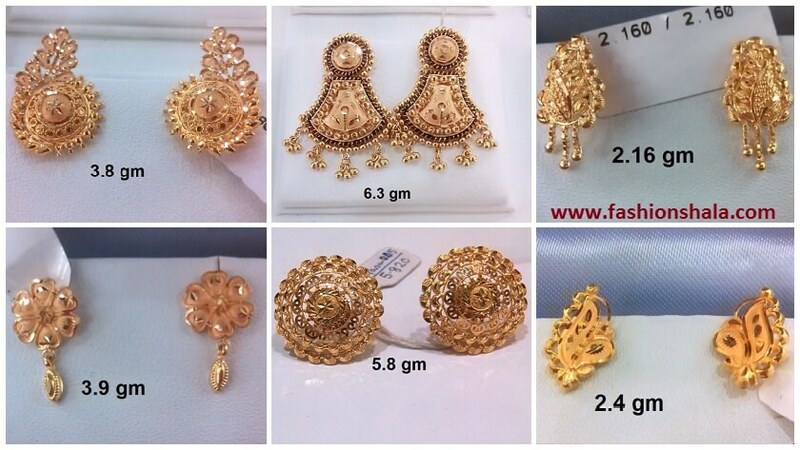 Gold earrings are a perfect gift for various occasions like wedding, bridal shower, etc. It is given as a token of love and good luck. the above-mentioned earrings are our favorite picks in gold stud earrings. Hope you got an insight of earrings. Happy Shopping!